Published May 17, 2017 Filed under Commentary, Under Our Dome, USN Columnists, Utah. Total of 1 comment in the discussion. Legal plunder is legalized theft. 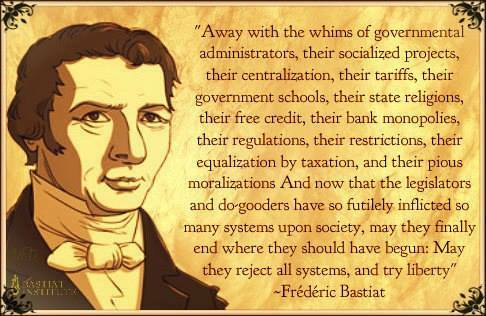 It occurs when “the law (government) takes from some persons what belongs to them, and gives it to other persons to whom it does not belong.” Thus, the law benefits one citizen at the expense of another and it does so by doing what the citizen himself cannot do without committing a crime. 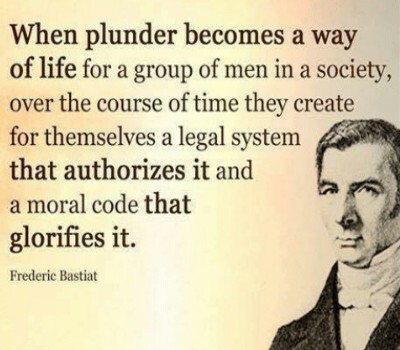 Legal plunder has two roots—human greed and false philanthropy and it takes many forms such as restrictive licensing, crony capitalism, social welfare programs of all types, public investments, quality of life programs and even publicly funded education. Once legal plunder becomes acceptable then the only question is whether the few plunder the many or whether everybody plunders everybody. Legal plunder, driven by a powerful civic-business-politico complex, is flourishing in Utah. This complex frames its arguments in terms of quality of life, economic development, charity and public investments where the civic and business organizations benefit from taxpayer funds and politicians gain recognition, power and re-election. So, rather than rolling up their sleeves and doing the hard work necessary to support their projects, members of the civic-business-political complex find it easier to get a handful of elected officials to force all Utahns to pay for projects that they themselves seldom, if ever, voluntarily donate to. In Utah, the state’s top business leaders demand that Utah citizens provide them with a well-educated and skilled workforce paid for with legal plunder. That is why these pillars of the community are demanding that the state’s personal income tax, which goes 100% to public education, be increased by a whopping 18%. This raises the question of why, if these oligarchs care so much about public education, don’t they make substantial contributions to the “Invest More for Education Account” when filing their Utah income taxes and encourage others to do the same? And, if they care so much for public education, why do they take charitable deductions and put their money in tax shelters since these deprive public education of large amounts of money? Furthermore, business interests are subsidized through legal plunder in the form of tax exemptions, taxpayer funded incentives and licensing requirements such as those that prohibit barbers from giving a short neck massage at the end of a haircut. Still other businesses are given an inside track on lucrative contracts paid for with legal plunder. Powerful banks and health care providers hire state legislators. Some businesses make their living off the issuance of bonds. Certain construction companies rely almost entirely on public projects paid for by legal plunder. Forced charity can be found in virtually all humanitarian ventures. Catholic Relief Services relies heavily on funds generated by legal plunder as do virtually all non-governmental charitable organizations which receive state, local and federal taxpayer support whether they are focused on the homeless, refugees or on cancer research and treatment. In most cases these organizations start out as pure charities but quickly graduate to forced charity through legal plunder. The leaders of the civic-business-political complex create personal legacies built on legal plunder. Some of the greatest plunderers are recognized as “A Giant in our City,” by plaques placed on buildings recognizing their vision and leadership, and by naming highways after them. Of course, the citizens who they plundered are not given any recognition even though they paid for the very things that the plunderers are taking credit for. Politicians who are especially adept at legal plunder can count on the support of those benefiting from the plunder in future political races and for jobs. In sum, while Utah’s civic-business-politico complex gives lip service to private initiative, self-reliance, free markets and voluntary, community driven action, the reality is that it replaces each of these as quickly as possible with legal plunder. It is time that Utahns become an alert and knowledgeable citizenry. The people of Utah need to deny the civic-business-politico complex of its legal plunder and restrict government to its proper, limited functions while recognizing that the law is justice and that “under the reign of right; under the influence of liberty, safety, stability, and responsibility — that every person will attain his real worth and the true dignity of his being”—without resorting to legal plunder.